James W. Loewen‘s Lies My Teacher Told Me was first published in 1995, and I had just graduated from high school. I read the book my freshman year of college. In thinking about the malleability of the past, I first think of this book — my first ah-ha moment when realizing that much of the history content I had learned and the narrative in which it was presented was not the iron-clad truth. I learned that history was messy, and yes, malleable. The digital world has both complicated and clarified historical thinking, historiography, and history classrooms. The digital age has complicated our work as educators because we can not longer rely on a singular authoritative text. This is not a bad thing, but it does make lesson plans and class preps more challenging for teachers. How do we choose which primary sources and secondary sources to use in our classrooms? Are we providing students with the freedom to draw their own conclusions or are we giving the illusion of choice? When I first began teaching in 2000, my school system emphasized having an “essential question” for each lesson. The digital world, with its seemingly infinite resources make the “essential question” exercise even more essential. Students need to know what they are trying to find, and have the intellectual training to recognize and achieve learning objectives. Likewise, teachers need to be able to articulate learning objectives and outcomes. With digital resources at our fingertips, students and teachers can share in the fluid and ongoing process of historical and critical thinking. In this way, learning in the digital age has clarified the ways in which we learn history. I had to read Loewen’s book to realize that the past was malleable and motivated/shaped by many forces. Students today come in with this knowledge and with the understanding that there are often multiple versions of “truth.” Often while teaching a student will ask a question, or I will pose a question to the class, and before I can say, “I’m not sure.” or “What do you think?” — students check facts, dates, and answer questions in real-time. They can enter class never having heard of Mother Ann Lee or Henry Clay or Sally Hemmings or Peggy Eaton or Joseph McCarthy, and by the end of class find themselves deep in a rabbit-hole of intellectual intrigue. This is made possible by the devices they hold in their hands or balance on their laps. Web 2.0 open sources and social media platforms have enabled, and frankly demand, that students ingest information differently and at a different pace than generations before. With this speed and efficiency also comes great responsibility. Teaching students what to do and how to process the malleable past in the digital age — that responsibility is up to us. We, as historians and history educators, are more important that ever. There is no more effective way of teaching history to the average American than to take him to the site on which some great historic event has occurred, and there to give him an understanding and feeling of that event through the medium of contact with the site itself, and the story that goes along with it. “Average American” . . . This key phrase in Chatelain’s quote strikes at the heart of the debate on how best to teach historical thinking and present historical narratives. If the target audience is an “average American” then who and what groups of people are considered “average” or “American”? Has the NPS, which is admittedly majority-white both in terms of staff and visitors, created a narrative reinforces a particular point of view. Inventory, audit, and edit all existing text at historical sites, parks, and locations. Seek creative common “bonds” between historic events or people with potential present-day audiences (ex. adventure, illness, animals, occupations, family, money). In other words, make history relevant. It appears as though the NPS is striving to do all of the above. In its film and through its website and physical site they have provided context, presented the native side of the story, and have created exhibited that provide a journey-like experience. At the San Juan Island they have also sought to encourage visitor engagement and ownership through crowdsourcing and social media projects to help with identification. Still, Whitman Mission and San Juan State Island site texts often takes a sensationalized tone with not-so-subtle hints of white bias. It is encouraging to see change and the modernization of NPS sites, and we should recognize that change takes time. In many ways, the mere publication of this article is an acknowledgement of the need for change. And that is a good thing. Going forward, government and non-profit sites must continue to seek a balance that encourages digital and physical visitors to their site. They must seek to engage audiences through programs that entertain but do not abandon scholarship. They must streamline the experience so that audiences are not confused while also complicating existing narratives that exclude or oversimplify. Historians will be key to this movement. History educators will also play a major role in making NPS sites meaningful and relevant to students. All the while, we must keep “average Americans” in mind. Koch articles goes on to show data that reflects the role of race, gender, and class in undergraduate history course retention rates. Racial and ethnic minorities are the least likely to pass a US intro history course, and males have a higher rate of failure than females. Although Wineburg and Koch are talking about different things, when I read Wineburg’s article I thought of Koch’s “Many Thousands Failed.” Wineburg argues that “reliable information is to civic intelligence what clean air and clean water are to public health.” This is a critical point, and one that history educators must confront in addition to the many other content- and pedagogical-related choices teachers make on a daily basis. His example from Our Virginia regarding slaves fighting for the Confederacy is part of a historical narrative that is surely a factor in the results produced by the Gardner Institute study cited by Koch. Are not all of this issues related? And shouldn’t the solutions be related as well? I think that digital media and online sources play a major role in addressing such inequities. At times it can seem an overwhelming task to address such different but related issues: 1) MACRO (Koch, what courses and content we teach) and 2) MICRO (Wineburg, how we teach courses and content). But they both affect student learning and success and beg the question, “Who is in the course, which students are learning, and by what definition do we measure success?” Digital media can be used to reshape both the what and how — one informs the other. Because if history educators do not fill the information vacuum with honest and accurate presentations of events, people, and evidence — the internet will. It is a tall order. Nevertheless, we must persist. 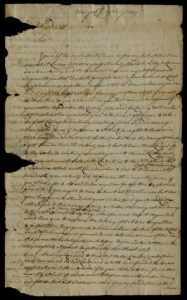 I would still love to develop a project based on the Slave Trade and primary sources; however, the plan has evolved significantly since my last update. In fact, it changed so much that I’ve redesigned entirely. In part, this is because I’ve had two important meetings this week with teachers with whom I am collaborating. Although the project has gone in a different direction, it is perhaps even better and certainly more tightly focused. The new topic, title, and digital project page? Below find a description of the project’s different digital components. It’s a great mix of sources, learning styles, assessments, I believe it also fosters interdisciplinary learning and “uncoverage” as Dr. Calder would say. There is still much to be figured and fleshed out, but I think the foundation and framework is solid, and I feel more grounded as well. Project components will be completed throughout the year, one per quarter. I will enter and upload primary sources with Dublin Core data, instructions, and other miscellaneous items by the end of this summer term. 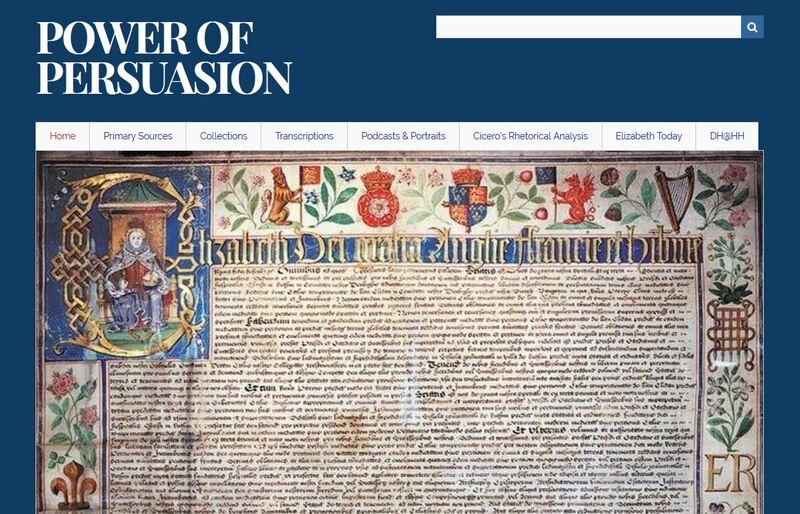 This project seeks to explore primary sources related to Elizabeth I. The types of sources are divided into three spheres that consider audience, scope, purpose, and meaning. 1. Transcription: Read primary sources and transcribe. Then, compare student transcription to published transcription. Harkness discussion on process and discrepancies. Student write blog reflection, which will form the basis of an Omeka collection and/or exhibit. 2. Rhetorical analysis: Read letters/speeches and analyze the use of logos/ethos/pathos, and the Ciceronian order of arguments. The final product will be an essay, which will form the basis of an Omeka collection and exhibit. Student will input Dublin Core data for proper citation and scholarship. 3. Image analysis: Make a podcast of a detailed “text” analysis of a painting of Elizabeth. Four portraits, students make podcasts in groups of four, each group discusses a different portrait. Podcasts will be represented as a collection and exhibit in Omeka. 4. Modern Female Politician: Pick a 20th or 21st century woman in politics and read a private source, a public source, and analyze an image. Present findings of analysis via oral presentation with Google Slides. Presentation files will form the basis of an exhibit in Omeka. Image (portraits): Below find links four portraits completed during Elizabeth I’s life. At the bottom of the page you can navigate between three pages of portraits. My audience will still be high school students, as stated earlier — but the A.P. Language will tie in with more World History courses rather than U.S. history. However, there is still a U.S. component as part of the final assignment. I’ve started an Omeka site with one small problem. I love the theme, but when I started adding items — a large “hero image” appeared on the homepage and I see no option to disable it. It throws off the formatting of the rest of the page. Perhaps Dr. Kelly can help, and I’ve also emailed Omeka. In conceptualizing my final project based on the Atlantic Slave Trade I am relying this week on sources from Gilder Lehrman Institute of American History. I chose Gilder Lehrman because they have free, accessible, wide-ranging resources for teacher of U.S. history, particularly for high school courses. I am also using Gilder Lehrman because they have detailed “information architecture” for primary and secondary sources. I will need to check for guidelines on reuse, but my hope is to mine resources from their organization in order to create consistency in terms of format, metadata, and scholarship. I selected this text by Robert Livingston because it presents a different view of slavery and slaveholders who sold and purchased kidnapped African men and women. 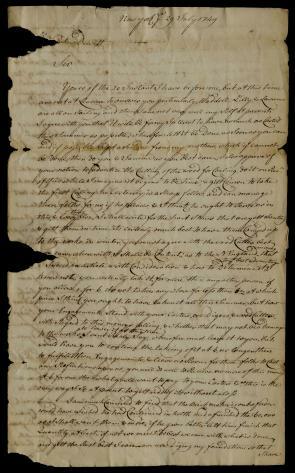 In addition to having a scanned high resolution for students to transcribe, there is also a full transcript available on the site. This would challenge students to dissect the writing before analyzing the language itself and the text’s meaning in its day versus present-day. As for the reasons I chose the following image and video file comes from my desire to mix different types of sources in this broader change-over-time topic. Both of these sources will inspire students to think about the slave trade from multiple perspectives. Also the lecture features a host of primary sources images. These sources combine presented expertise (Philip Morgan) with a primary source for analysis. My goal is to challenge students to think about the issue of slavery and the slave trade and to apply historical empathy as Wineburg described. Philip Morgan: The African Slave Trade, 1500-1800 from The Gilder Lehrman Institute on Vimeo. I’d like to frame this blog post based on the questions I answered for my entry titled “Teaching History Today.” In answering these questions again, I will apply the use of images/film to lead students to deeper historical inquiry and discovery. 1. How do I make history relevant to students? I believe that images and films are vital components of teaching history. Never should they drive the content; however, they can be used to spark intellectual inquiry and to analyze and provide sub-text, text, and context. Images and film can also be used to make history relevant to students in ways that lectures and readings cannot. Aside from the fact that many students are visual learners, images and film can also complement content and inspire critical thinking when compared, contrasted, and discussed. It is for these reasons that I use many images in my courses — and see media as valuable on multiple fronts as primary sources, as case studies, and as part of a more comprehensive presentation of content. 2. How do I make teaching history interdisciplinary? While I cannot assess my effectiveness as a history teacher who approaches teaching from an interdisciplinary perspective, I can confirm that I strive to teach history this way. At some point in each U.S. history unit the class has a lesson on the era or period’s art, music, science/technology, and primary video clips (when applicable). For example, when I begin teaching Manifest Destiny our first lesson involves analyzing paintings related to the theme including Gast’s American Progress among six others. I use the lesson as a jumping off point for the unit. In terms of film, when studying the Cold War I use video clips of “Duck and Cover,” “Red Menace,” and 1964 campaign ads as part of our content. For our unit on the Civil War I do a lesson called “God is on our side,” and the classes analyzes and listens to several Civil War era songs. We begin with the lyrics and then move to performances of the songs by various artists and groups. Songs include “Bonnie Blue Flag,” and “Lincoln and Liberty” among others. One final example of interdisciplinary teaching is during our study of the Gilded/Progressive Era where students, in groups, each choose a discipline-based theme and create a historic newspaper with articles written by the students that reflect issues relevant to that time period. So in many ways, the use of images and film in my class are what makes my teaching history more interdisciplinary. 3. Why do I teach history, and should the method matter? I will repeat the first part of my answer from the original post and then apply the use of images/film to the second part of the question. Absolutely the method matters. Perhaps more important — effective and varied methods matter. It doesn’t matter if you use primary sources if you don’t use them in a way that influences and increases student learning. Dr. Caldor, in his theory of “uncoverage” mentions that in trying to redesign his course he taught one semester with primary sources, hoping that this approach would transform his classes and lead to greater historical thinking. He admits it was a failure, painful, and was in some ways more dry than just lecturing. Varying pedagogical methods and using them effectively lead to student engagement and it is only when students are engaged that deep and critical learning can take place. Films and videos are keys to creating a pedagogical “tool bag” that can enhance such student engagement. The audience for my final project is students ages 13-18 who take Latin and Ancient History and Geography as well as AP English Language and AP U.S. History. The Latin/History project will focused on 7th graders and 12th graders, and the English Language/U.S. History project will be focused on 11th graders. In addition, the audience will also include (indirectly) fellow faculty members in the humanities at the Harpeth Hall School who can use this projects and methods as inspiration for future DH work. I am still unable to speak with specificity about my final project because it involves working with other teachers in other disciplines and those meetings are scheduled for next week. However, I do plan to create two projects with a Latin teacher that overlap with history. The first is a project that involves ORBIS and also makes use of several historical primary sources including Diocletian’s Price Edict. This project will be designed with an interdisciplinary focus that includes economics, Latin, and history. The second project involves the use of open-source programs such as Voyant, Knot, and Palladio. The other group I am working with includes US History teachers (both AP and non-AP), English literature teachers, and AP English language teachers. I also envision designing a project with them that use Voyant, Knot, and Palladio using primary sources that service both disciplines. However, I would also like to create a crowdsourcing project, perhaps using oral interviews uploaded and marked using the University of Kentucky’s OHMS database. The details of this project should emerge more next week. 1. How will digital media and/or digital tools be important to teaching my target audience one of the essential lessons I’ll be focusing on in my project? All of these projects will involve students as both consumers and producers in terms of digital media and digital tools. 2. What, specifically, about the digital environment will influence what you do and why? I intend to use the digital environment to give create student-teacher learning whereby there are general outcomes but the mode, manner, and method will be shaped by a process of discovery. I would like to follow both Wineburg and Caldor’s models of empathy and uncoverage. I will also need to make sure that the digital tools used in these projects enhance and enrich the curriculum rather than diminishing or detracting from it.